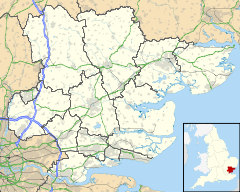 For ither uises, see Chelmsford (disambiguation). 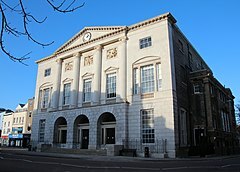 Chelmsford (/ˈtʃɛlmzfəd/) is the principal dounset o the City of Chelmsford an the coonty toun o Essex, in the East o Ingland. It is locatit in the Lunnon commuter belt, approximately 32 miles (51 km) northeast o Charing Cross, Lunnon, an approximately 22 miles (35 km) frae Colchester. The urban aurie o the ceety haes a population o approximately 120,000, whilst the destrict haes a population o 168,310. ↑ 1.0 1.1 "2011 Census - Built-up areas". ONS. Retrieved 11 August 2013. ↑ "Chelmsford". Collins Dictionary. n.d. Retrieved 23 September 2014. ↑ "ONS – 2011 Census, Key Statistics for Local Authorities in England and Wales". ↑ "Census 2011: Key Statistics Chelmsford" (PDF). Chelsmford City Council. Retrieved 17 March 2015. Wikimedia Commons haes media relatit tae Chelmsford.